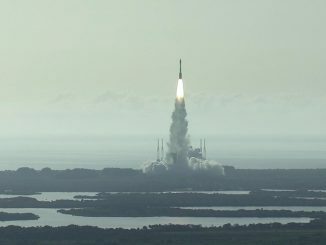 The United Launch Alliance Atlas 5 rocket lifted off from Cape Canaveral at 8:37 a.m. EDT (1237 GMT) today to deploy a classified satellite in service to the national security of the United States. Follow the mission in our live journal. 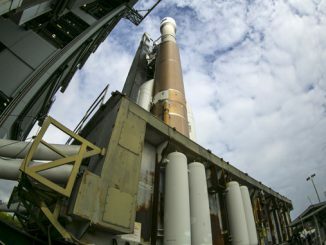 Ready to deliver 1.5 million pounds of thrust Thursday morning, an Atlas 5 rocket was rolled from its assembly building to the launch pad today for its national security satellite-deployment flight. 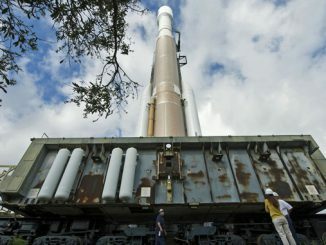 An Atlas 5 rocket carrying a classified national security satellite was rolled to the launch pad this morning for Thursday’s flight to bolster the U.S. intelligence-gathering space architecture. 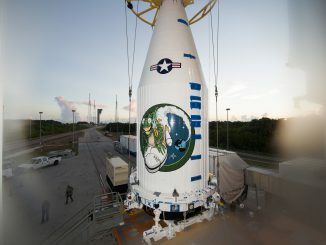 Already shrouded in the Atlas 5 rocket’s Extra Extended Payload Fairing (XEPF) aluminum nose cone, the National Reconnaissance Office’s NROL-61 satellite was delivered to Cape Canaveral’s Vertical Integration Facility on Tuesday, July 19 and lifted aboard the United Launch Alliance vehicle for flight. 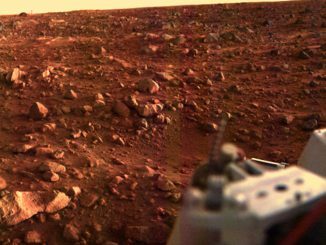 Four decades after NASA’s Viking landers acquired humanity’s first view of the surface of Mars, a planet whose reality lived in the imaginations of skywatchers for millennia, a definitive smoking gun for microbial life there still eludes scientists. 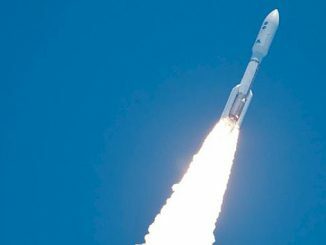 America’s next Mars rover, a $2.1 billion nuclear-powered vehicle to search for evidence that life once existed there, will be launched to the Red Planet in the summer of 2020 by a powerful Atlas 5 rocket. 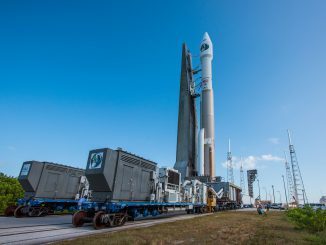 Good weather for launching a rocket is forecast for Cape Canaveral and the Space Coast on Thursday morning when a United Launch Alliance Atlas 5 is scheduled to take flight. 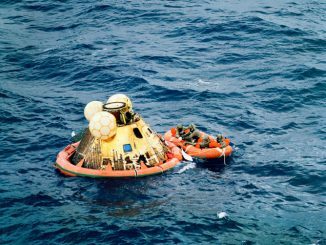 Apollo 11 splashed down in the Pacific today in 1969, fulfilling President Kennedy’s challenge to a nation of landing a man to the Moon and returning him safely to the Earth. 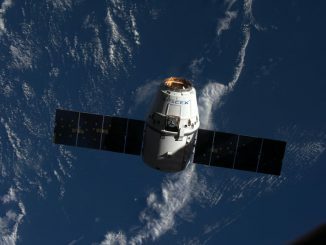 The Russian Progress 64P autonomous cargo ship docked to the International Space Station on Monday and the commercial SpaceX Dragon CRS 9 vessel was captured by the station’s robotic arm and berthed to the outpost on Wednesday. 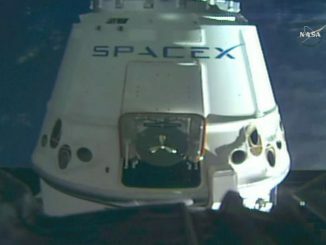 A commercial resupply freighter owned and operated by SpaceX wrapped up a two-day trip to the International Space Station on Wednesday, delivering a new docking port and two tons of other equipment to research laboratory more than 250 miles above Earth.